On Monday morning, 15 August 2005, our tour group departed the hotel by bus at 8:10. 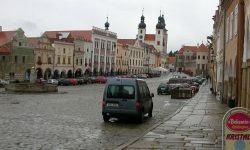 About 10:30 we stopped at Telč in Moravia. For an hour we walked about the historical section. 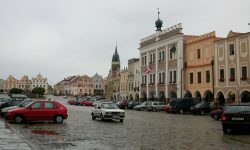 The buildings have been preserved as they appeared in the 1700's. This pretty village would have been a pleasure to see if it had not been raining. We purchashed a very detailed set of maps of the Czech Republic at a bookstore in Telč. Here we were within several miles of the village of Kninice where Michael's paternal great-grandmother, Katie Svoboda, was born in 1852. In the area are rolling hills with many trees and large clearings of cultivated farmland. We stopped about 1:30 in downtown Brno (pronounced "Bruno"). The second largest city in the Czech Republic, Brno is the capital of the region of Moravia. Everyone in our group was dropped off for lunch with sketchy instructions for where to eat, but told to return in 1 hour. The two of us finally found a restaurant and shared a table with Marc & Nora. The prices were great and the menu had photos. We ate authentic Moravian dishes that we found to be very tasty. After Moravska cibulacka (onion soup), Michael ate Krusovicky rizek (stuffed, breaded pork) and Jeannie had kure mariane (chicken medallions topped with mozarella and tomato) and krokety (potato croquettes). Surprisingly, everyone barely returned on time to the bus. We continued on to the Czech-Austria border and crossed after a minimum delay on each side. It rained the entire trip. We arrived at the Hotel Ananas in Vienna about 5:30 p.m. We discovered the red traffic light in Vienna flashes just before turning green. The green light begins flashing immediately before changing to yellow. The Vienna phone book listed 10 Thuma and 120 Tuma, the surname of Michael's ancestors before his grandfather changed his last name to Coleman and later Cole. Our tour group was transported at 7:00 to enjoy an Austrian supper. A violin player and an accordian player accompanied a singer of several German songs while we ate a nice Austrian meal. We returned to the hotel about 10 p.m.